Do you knit patterns more than once? I usually prefer to knit something new, but sometimes a pattern begs to be knit more than once, often because I finish it for the first time and think someone else I know might like one of those. Ishbel by Ysolda Teague is a shawl I’ve made a few times, and I’ve recently made the Brighton Beach shawlette by Dieuwke Van Mulligen for the second time as a birthday present for a friend. Bella by Dani Sunshine made a lovely matching set of cardigans for a new baby and her big sister. The Meredith Baby Cardigan by Ruth Maddock created two very different finished objects using different colour combinations: a warm cream with pale blue buttons for a baby boy, and navy with Liberty print floral buttons for a baby girl (which I wrote about here). That’s the inside of the sole, which is covered in the fleecey ends of pieces of unspun fibre (or thrums) which are knitted into it as you go. They make a lovely, warm and squishy lining, which felts together with wear. There’s a photo at the end of this post which shows the outside of the sole. 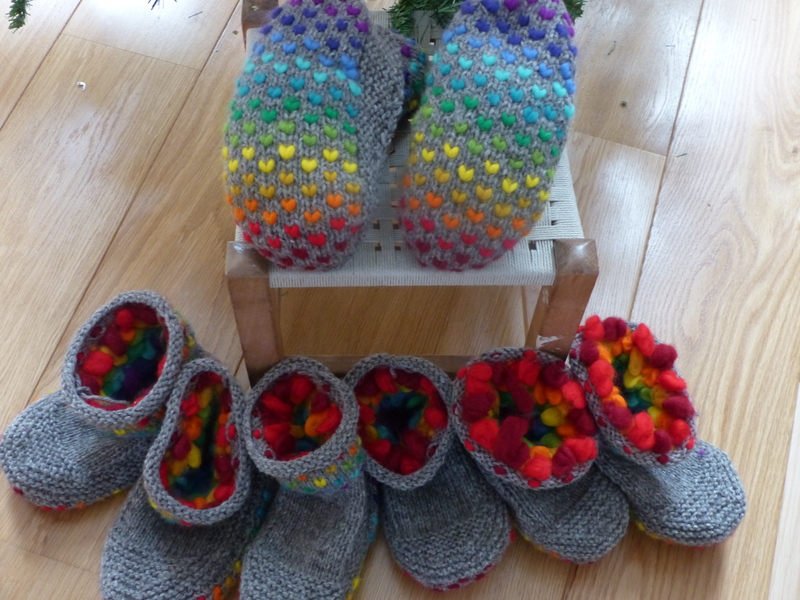 I made my Cadeautje using rainbow thrums, with twelve different hues painting a rainbow from toe to heel. 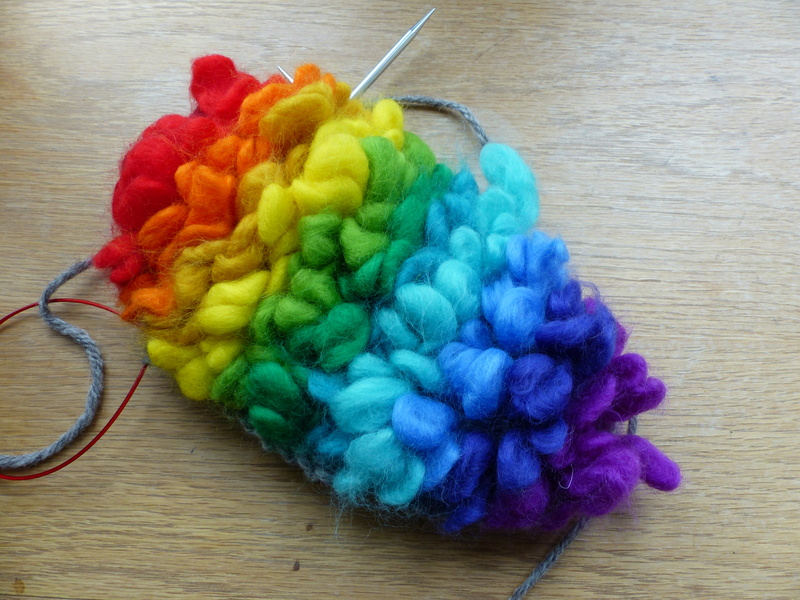 I bought a mixed selection of coloured fibre from World of Wool in the UK, which has a really wide range of different coloured dyed merino tops (as well as other wool breeds and natural tops). The main yarn I used is New Lanark Chunky yarn in the neutral grey, Pebble. This was the first time I’d made thrums, and it’s a really fun technique. The instructions in the pattern suggest that it’s a good idea to make a batch of them at a time so you don’t have to keep stopping between stitches to make each thrum as you go, and I think that’s a really good tip. If it’s your first time making thrums too, I thought some pictures of the process might be useful. Below I’ve shown how to make a thrum and how to knit it into your fabric. 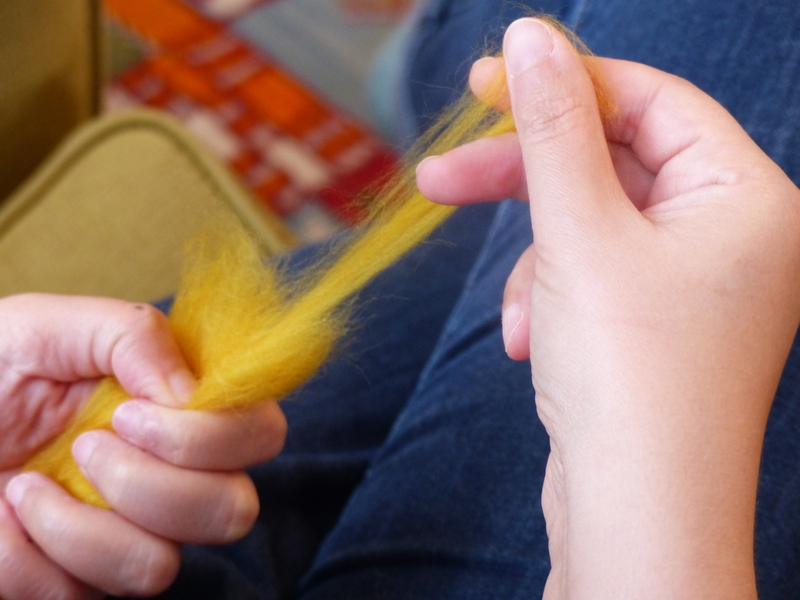 Gently pull off a length of fibre to make your thrum. Fold the ends in so that you have a loop at either end. 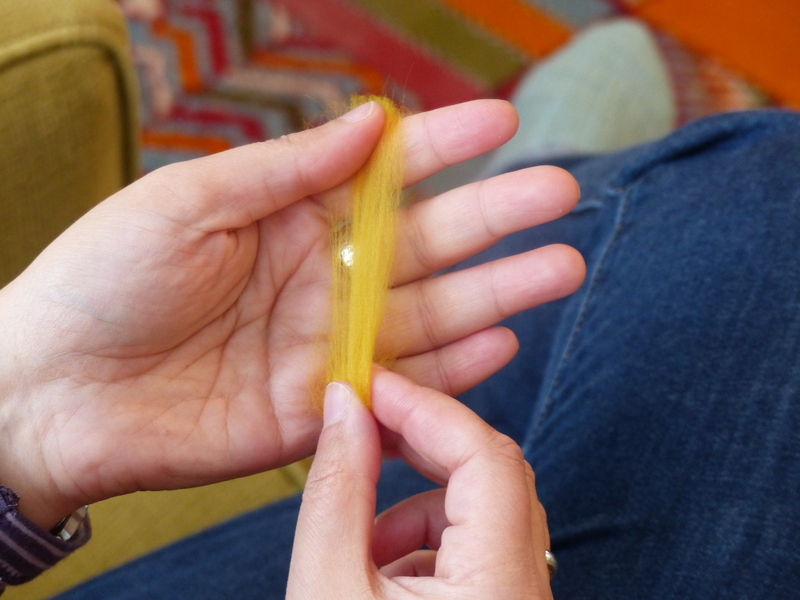 The chunkier the width of your thrum, the larger the coloured stitch will appear on the right side, and the longer the piece of fibre is, the more fibre you will have lining the inside. If you want a uniform effect, you should try to keep the thrums a similar size. I tended to use any slightly smaller ones nearer the edges of the sole, as there would be less need for padding there. The one I’m making below was for the cuff of my Cadeautje. I made them longer and wider for the sole so it would be more cushioned. When you come to add your thrum to your knitting, you will have the right side of your work (i.e. the outside of the sole, if you are making Cadeautje) facing you. 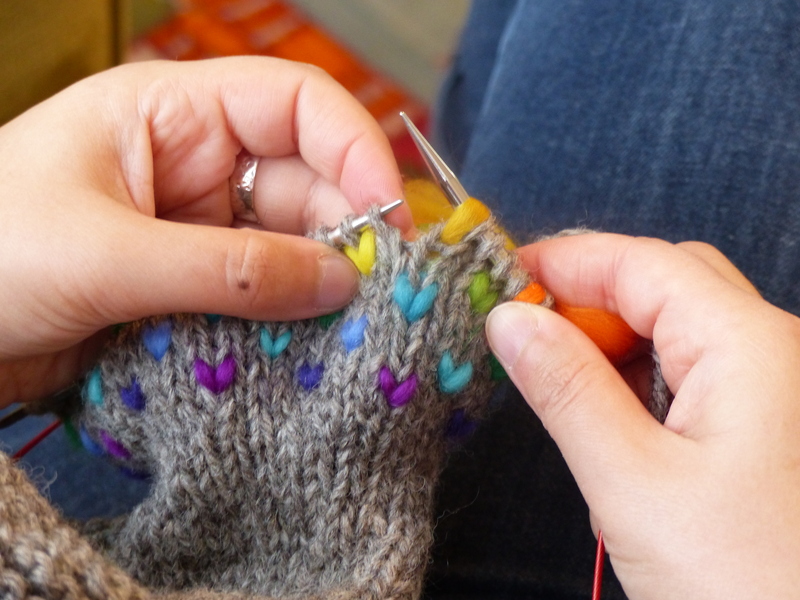 Insert the working needle into your stitch and wrap the yarn round it as if you are about to knit. Lay your thrum around your needle (over the wrapped yarn) so that the two looped ends hang along the wrapped yarn (first picture below). 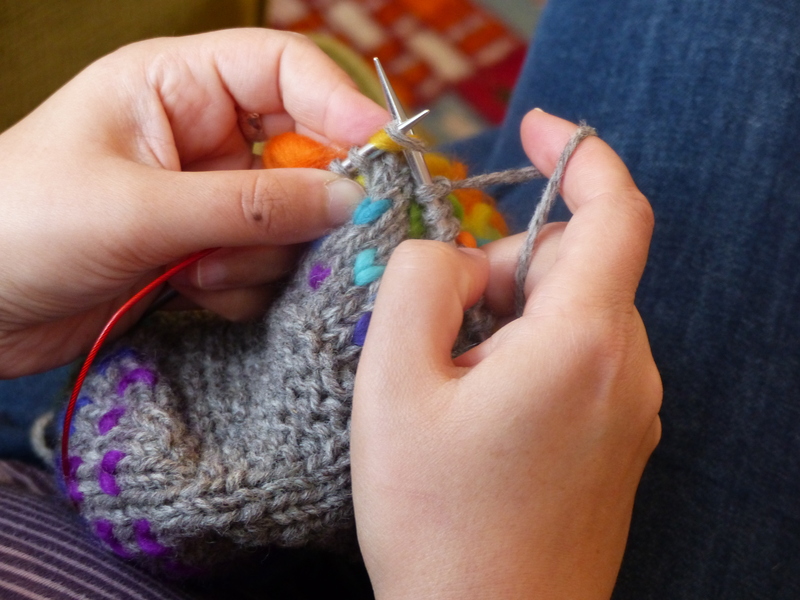 Then, holding the two loops of your thrum and your wrapped yarn, knit them as one stitch. Your knitted thrum will look like the second picture below, with the yarn and fibre lying close together. 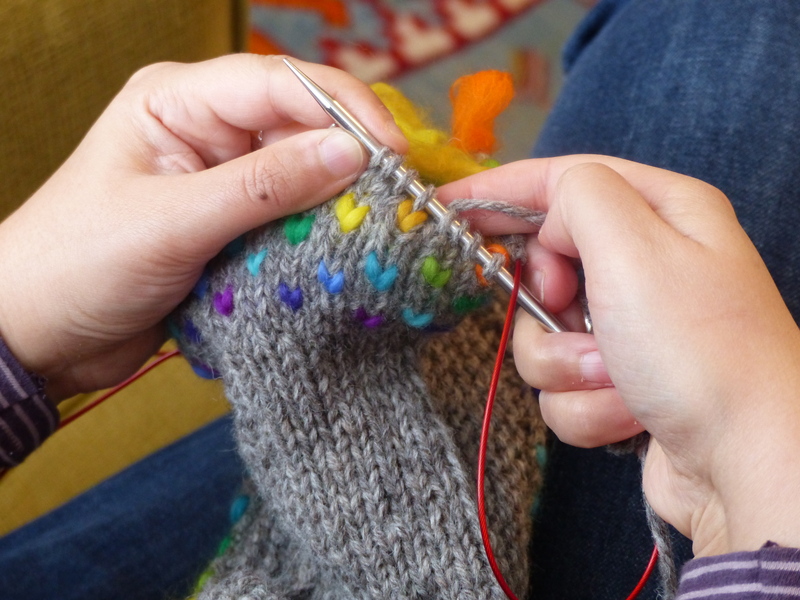 On the next row (working on the right side if you’re knitting in the round, such as on the cuff of the Cadeautje slippers or on the wrong side if you’re knitting flat, such as on the Cadeautje sole), when you get to the thrummed stitch, you knit (or purl on the wrong side) the yarn and the thrum fibre together as one stitch (see first picture below). Once knitted, your thrum will look like the second picture below (where I’ve knitted three stitches past the thrum). If you’re racing to complete Christmas gift knitting or craft projects, good luck with them, and I hope you have a very happy festive season. This entry was posted in Uncategorized and tagged Cadeautje, gift knitting, how to make thrums, knitting, thrums, Ysolda Teague. Bookmark the permalink. It’s the Cadeautje pattern by Ysolda Teague. If you search for it on Google or Ravelry, you should be able to find how to buy it – it’s a great pattern!